The term "Passive House" (not to be confused with passive solar design, though there are overlapping principles) refers to a design and construction standard that aims to drastically reduce heating requirements in homes so that oversized conventional heating systems are no longer necessary. The homes maintain constant temperatures and do not rely on wasteful amounts of fossil fuels to continually heat and cool, therefore passive. The strategy of a Passive House is to reuse "free" heat to heat the home. "Free" heat is generated from all electrical and gas appliances such ovens, refrigerators, computers and light bulbs. The building envelope of a Passive House must be extremely well insulated and air-tight so that this "free" heat can not unintentionally escape out of the building. A mechanical ventilation system, with an air to air heat recovery component, is installed to simultaneously bring in fresh air and remove the same amount of stale air. The stale air leaving the house is carrying the "free" heat. It goes through the heat recovery ventilator, and transfers the heat, to the incoming fresh air, before it leaves the building. The cool, exterior fresh air comes into the heat recovery ventilator, picks up the "free" heat and goes into the home warm. The cost of a conventional heating system can be saved and the savings invested in better insulation, air-tightness, windows, ventilation and a less expensive backup heating system. Energy efficiency ratings of cars are measured in miles per gallons. Homes are rated for energy efficiency in Kilowatt hours per square foot per year. (KWh / ft² / yr). 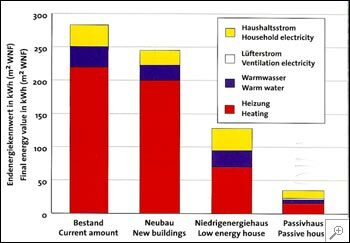 The chart to the right breaks up energy consumption of homes in different categories, including space heating (red), warm water (blue), electricity (yellow) and electricity for ventilation (white). 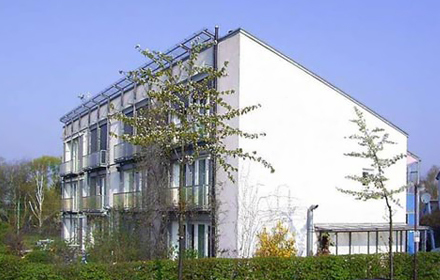 Pictured above is one of the original Passive Houses in Daarmstadt, Germany, from Wikipidia. 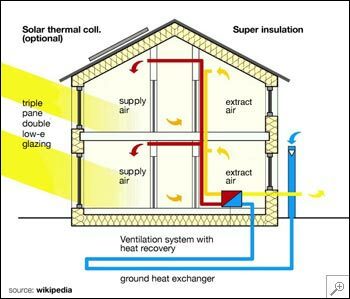 A diagram from the Wikepedia website of a Passive House for a very cold climate. Passive Homes are designed according to their specific climate conditions. Triple pane windows are not always required. The ground heat exchanger is also optional.